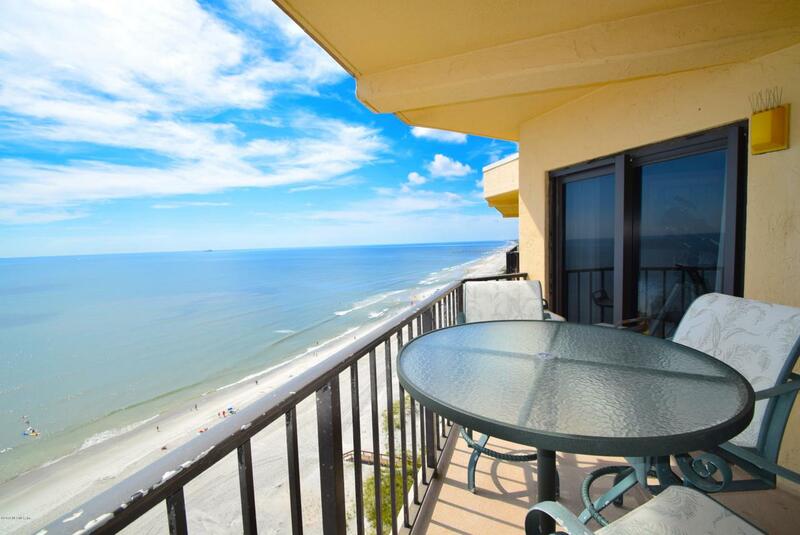 Miles and miles of ocean views from the highest point in JAX BEACH. Positioned on the top floor (18th) and has views to the north and south from all living areas. Nowhere else will you find a residence that appreciates expansive views of the blue waters of the Atlantic Ocean to include Neptune and Jax Beaches. Front entrance has impressive views to include downtown Jax, notable bridges, etc. Includes ritzy amenities; gated access, workout rm, storage and gathering rm, spa, pool, garage parking, tennis courts. Upgraded kit; soft close drawers, glass cab doors, tiled backsplash. Owners suite has breathtaking views to the ocean, lg closets, upgraded bath. Sliding doors open to balcony. Exc cond. REMARKABLE views. Bring Reasonable offer. Owner Motivated. LEASE PURCHASE avail. Listing courtesy of Assist2sell Full Service. © 2019 Northeast Florida Multiple Listing Service, Inc. All rights reserved. The data relating to real estate for sale on this web site comes in part from the Internet Data Exchange (IDX) program of the Northeast Florida Multiple Listing Service, Inc. Real estate listings held by brokerage firms other than Ponte Vedra Club Realty are marked with the listing broker’s name and detailed information about such listings includes the name of the listing brokers. Data provided is deemed reliable but is not guaranteed. Data last updated 2019-04-18T23:23:58.56. Kathleen Floryan and Ponte Vedra Club Realty is Ponte Vedra Beach and The Beaches Area's most innovative real estate team.